Piano solo to complement inward and outward spiritual growth and manifestation. Music for Planetary and Individual Transformation is a downloadable .mp3 or FLAC intended as an adjunctive, supportive modality to help assist listeners to help precipitate the anticipated dimensional shift on this planet. Listening Suggestions for Music for Planetary and Individual Transformation. Available INSTANTLY. After you make your payment, you will be given a password which will allow you to download the .mp3 or FLAC version of Music for Planetary and Individual Transformation. You will then be able to hear the complete track on your computer. If you prefer, you may use your CD burner on your computer to burn a CD of the track, which you then will be able to play on any CD player. 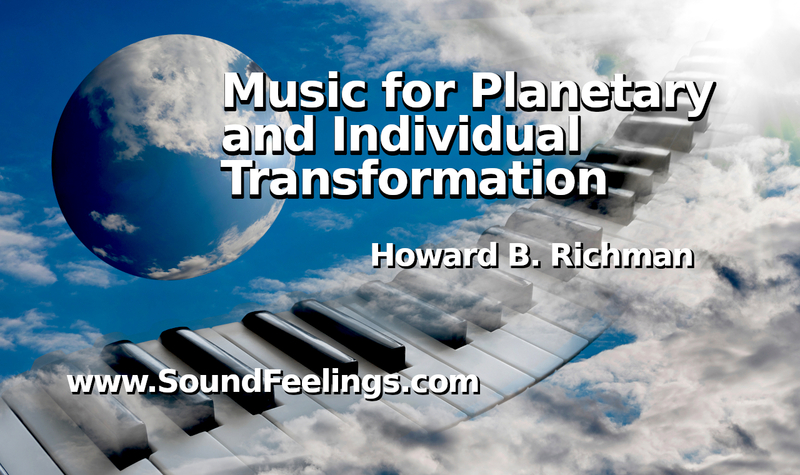 Howard B. Richman, Teacher/Pianist/Sound Researcher, has blended his advanced music training and his intuitive awareness to create music for transformation since 1982. Mr. Richman’s specialty is to help people break through their most stubborn blocks. He performs and speaks throughout the United States and abroad.